The summer’s coming to an end. Moms and dads everywhere are making sure their children have everything they need to ensure a good upcoming school year. This is a great time to take your child for an eye exam, if you haven’t already. A huge percentage of learning is accomplished visually. But even with this obvious link between sight and learning, a lot of people don’t seem to be aware of how frequently occurring vision problems are, and as a result, don’t get their child’s eyes checked often enough. 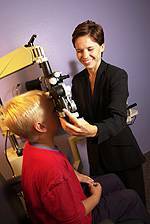 As your kid’s vision may change frequently, regular eye and vision care is necessary for success at school. It is even more important to look out for the signs and symptoms of vision problems as your child progresses in school. Struggling to meet the visual demands at school may affect his or her academic growth. New technology brought into the classroom, such as the use of interactive whiteboards, can also potentially provoke previously unknown vision problems. Without adequate vision, kids can be at a disadvantage not just at school, but also mentally, physically and emotionally. If you’re the parent of a child who wears glasses already, now is a great time to reassess the suitability of his or her current frames and maybe even buy new glasses for your child for the new school year. The more your son or daughter feels good in his/her glasses, the more they’ll be worn! Find a good time to stop by to see us when you’re getting your kids prepared for their year. We’ll do our very best to help all the kids we treat commence the year afresh with vision that’s in excellent condition.